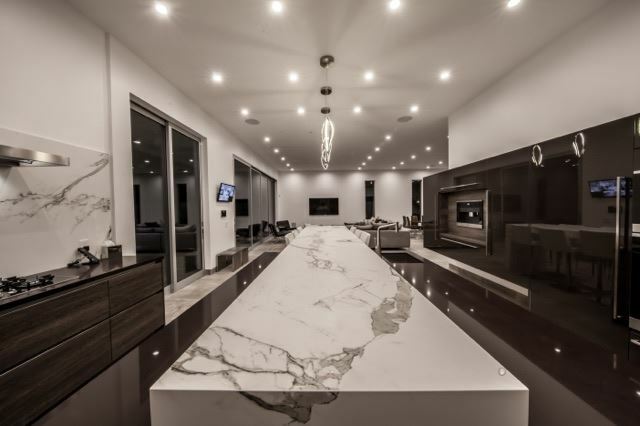 Completed in 2016 and now available to filmmakers, this stunning Contemporary Mansion in Los Angeles boasts 22’ tall ceilings, a double height glass entry foyer, a 13’ rectangular crystal chandelier, and modern finishes, fixtures and materials. Its 40 solar panels, rain garden, and drought tolerant landscaping make it an environmentally conscious design. The house is 5,700-sf on three levels with an additional 4-car underground garage. With 5 bedrooms, 8 bathrooms, and an open main floor layout, the property also features a pool, spa and fully equipped outdoor kitchen.